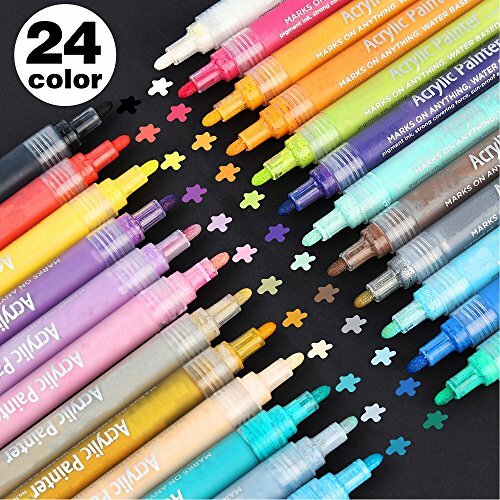 Lelix acrylic paint marker pens are working on almost any surface, such as rock, wood, metal, colored paper, canvas, fabric, pottery, plastic, leather and more. Ideal for artists, beginners, kids and adults. Put the tip up and shake the marker slightly for several times. Gently press the tip up and down to pump the ink. Start to create with these vibrant colors and express your passion. -Recap tightly after use to ensure long shelf life. -Children should be accompanied by adult to use it properly. -Please storage it in positions where children could not reach. Lelix acrylic paint markers includes 24 rich and vibrant colors, which is more than conventional sets. The acrylic paint markers has a hard colorful cardboard box. The water-based ink is waterproof, UV-resistant, permanent, odorless, environmentally-friendly, mixable, non-toxic and acid free, Suitable for artists and beginners, kids and adults. Great for DIY artwork on rock, wood, metal, colored paper, canvas, fabric, pottery, plastic, leather and more. It is easier to carry and use than acrylic paint set. With 2 mm round tip, these medium tip acrylic paint marker pens are perfect for both fine details and filling in large areas. Pump-valve system provides an accurate flow control, the rubber finish and opaque barrel shows you the ink remaining in time. Lelix provides high level customer service : we make 100% Satisfaction Guarantee. If you have any questions about this product by Lelix, contact us by completing and submitting the form below. If you are looking for a specif part number, please include it with your message.